Though the framework for the coding of evaluation and management (E/M) services has been in place for more than 10 years, serious and widespread misconceptions remain regarding the most lucrative, efficient, and legitimate ways to calculate E/M service levels. There are two primary schools of thought on the matter, but first a little background. The three basic components of E/M coding are history, exam, and medical decision making. History represents taking a report of the present illness, conducting the review of systems, and capturing medical, family, and social histories. The exam portion is similarly straightforward, reflecting a general multisystem exam, single-system exams, or a number of body areas and organ systems. The component that remains most mystifying, medical decision making, is based largely on the number of diagnoses or management options, the amount and complexity of data to be reviewed, and risk, morbidity, and mortality. According to the strictest interpretation of the official guidelines (the 1995 and 1997 Documentation Guidelines for Evaluation and Management Services) from the Centers for Medicare & Medicaid Services (CMS), one must document two of these areas when submitting a claim for services provided to an already-established patient. That’s about where the agreement ends. One group—call them the “Any Twos”—believes it may and should document and calculate E/M levels based on any two of these three components. Following the guidelines in the narrowest sense, Any Twos claim to justify high levels of E/M service even though they may consistently use only history and exam criteria. The fact that these are considered easier to document and calculate makes this approach tempting for coders, administrators, physicians, and consultants. The other group—the “Medical Decision Making Plus Ones”—argues that medical decision making drives medical necessity and, therefore, must be one of the two components. More so than history or exam, medical decision making represents the actual value of a physician’s work. To justify billing for a relatively high level of E/M services, practitioners should document a relatively complex medical decision-making process, not just copious notes on the history taken and the exams performed. To borrow an example from Tray Dunaway, MD, a surgeon, author, and consultant, the Any Twos could technically bill at level 5 for a patient who presents with a hangnail. Just take an extensive history, perform a comprehensive physical exam, and document everything. But if it becomes a regular pattern, the organization should expect an audit and, possibly, charges of fraudulent billing. In other words, getting paid is not the same as keeping it. While the CMS doesn’t define medical necessity for E/M, it refers to it often and expects healthcare practitioners to document it. When advocating an approach to E/M coding that’s driven by medical decision making, concerns are bound to be raised. In this section, we’ll consider the underlying issues, possible workflow changes, and the potential results. With proper documenting and procedures in place, organizations can often bill for E/M at higher levels without risk of overcoding or undercoding. And, without seeing more patients, they may be able to increase legitimate revenues without attracting unwanted attention from auditors. Objection: It doesn’t affect us. 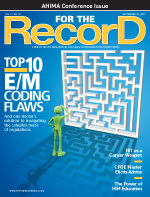 Indeed, E/M codes may not be relevant in some areas, such as radiology. But broadly speaking, E/M codes are everywhere, and in terms of volume, they represent approximately 80% of all encounters billed. Perhaps most importantly, the CMS has been targeting E/M in its recent recovery programs, and it’s been paying off—a $23 return for every $1 invested in recovering overpayments. Objection: It’s too difficult. There are ways to simplify calculation of medical decision making. Certain aspects, such as the number of diagnoses and the amount of data, are already straightforward. And calculating risk is easier than most people realize—even without using software. Dunaway has developed a method that starts with medical decision making and works “backward” from the problem. After determining medical decision making through a simple, tabular formula, the correct code will be identified and all necessary supporting documentation can be captured. Objection: We’ll have to buy an EMR. While using an E/M calculator built into an EMR system is efficient, it’s not necessary. All an organization needs is a structured, systematic method. The point is moot, however, because most practices will be using an EMR thanks to recent economic stimulus legislation. What you really need to know is that all EMRs are not created equally. After all, software developers are not E/M coding specialists and vice versa. When building solutions, quite a few vendors stop their research efforts at the published E/M guidelines. Therefore, the logic of the E/M calculator may not reflect the medical decision-making–driven approach. How an EMR’s E/M coding calculator was developed may be one of the most important questions to ask when evaluating different systems. All EMRs will work one of two ways: with static or customizable question templates. In the case of the former, the physician user may need to learn how the EMR maps encounter data to the E/M framework. If physicians customize their templates, part of that process requires correlating the template data with the E/M components. Objection: I don’t have time for this. Healthcare professionals have no time to spare, but the real issue is a matter of time and cost. Fortunately, when it comes to E/M coding, it’s the quality of care and quality of documentation—and not the quantity of documentation—that matters. A small amount of additional time can generate much more revenue. Say, hypothetically, that for 20 daily patient visits that last 20 minutes each, Dr. Eval justifies a level 3 claim worth $46 on average. Dr. Mana takes an extra two minutes per visit for proper documentation, and she bills level 4 claims worth $90. With just 40 more minutes per day, Dr. Mana collects nearly twice the revenue. And she can be confident that it’s neither overcoded nor undercoded. It’s a complex issue, but E/M coding driven by medical decision making is the more appropriate method. The best news is that it can be a benefit to both reimbursement and risk management. — Stuart Newsome, CHCC, is vice president of business development for Unicor Medical.